Daily messages from former Broadway Star and Personal Trainer, Robin (Boudreau) Palmer, who motivates you to wake up and workout en Español with Dr. Cesar Vargas! Cesar Vargas is a Trainer and Master of Neuro-Linguistic Programming, Hypnosis, and Emotional Freedom Techniques with an office in the Heart of Orange County, California, where he helps English- and Spanish-Speaking individuals and groups optimize the use of their minds to reach their personal and professional goals. Cesar has a Doctorate in Clinical Hypnotherapy, a Masters in Education and a Bachelors Degree in Behavioral Science. He is Board Certified by the International Board of Clinical Practitioners, the Society of Applied Hypnosis and the International Association of Clinical Hypnotherapy. He is also a translator of self-improvement books, such as Spiritual Marketing, Feelings Buried Alive, Never Die, The Science of Success, Practical Spirituality, Success Secrets of the Rich and Happy, The Science of Getting Rich, among others. He is also the author of the upcoming book Your Life is Your Masterpiece. Cesar is a Guest Expert in the Spanish radio program Las Comadres, at Radio KAMA 750 AM, in El Paso, Texas. OR Enjoy Waking Up Inspired with Renowned Experts Every Day for an Entire Year and SAVE 60%! Wake up your body each morning with gentle guided stretches in bed, exercise tips of the day, music to get dressed by and a standing ovation! My Workout Wake UP Call® messages wake you up positively focused on achieving your goals, first thing in the morning, when it matters the most! MP3 instant downloads for all smartphones, tablets, desktops and all devices. My Wake UP Call is... BRILLIANT! I love this wake up call product!It is such a great idea! This wonderful product helps people wake up and puts them in a beautiful mindset. This is a very powerful tool to make the law of attraction work at an accelerated rate. Make the most of the most important five minutes of your day! Enjoy the good nights sleep that you deserve! Research shows that our minds are the most open and receptive during the first and last five minutes of the day, while in Alpha state. Wake UP to the Life of Your Dreams with My Wake UP Call® Motivational Alarm Clock® Messages! 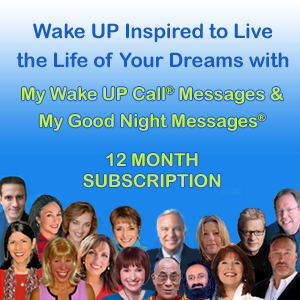 Start and End Every Day Inspired to Live the Life of Your Dreams with My Wake UP Calls® and My Good Night Messages™!